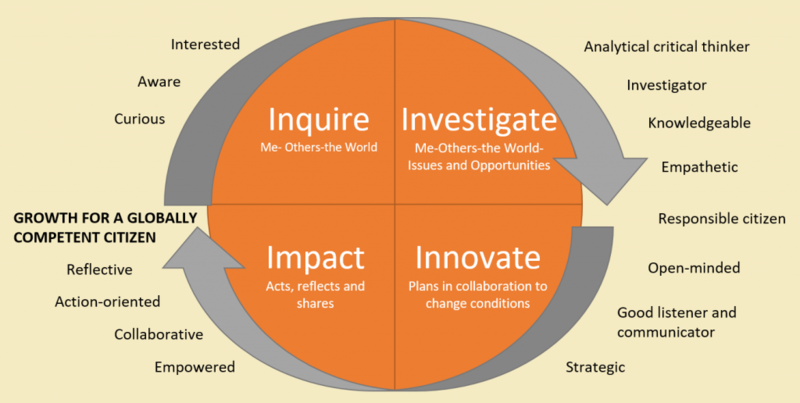 What is Service Learning? Service Learning is an approach to teaching and learning that integrates community service with classroom learning. 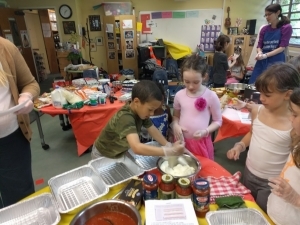 It results in meaningful projects where students’ efforts benefit their community while they gain experience in civic responsibility and teamwork, and deepen their knowledge of core curricular themes. Each year, grade levels partner with a different , local organization and engage in service learning projects. 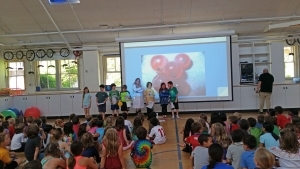 Last week, students presented their learning to the entire school community. Kindergarteners worked with Tara, the Good Shepherd Center gardener, to maintain and care for a garden on campus. 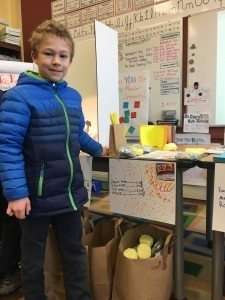 In connection with Global Studies, students explored ocean pollution and learned how we can protect the planet by reducing, reusing and recycling! 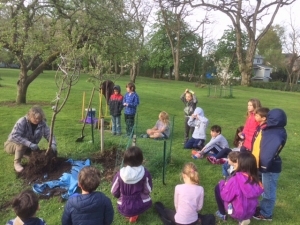 First Graders partnered with local nonprofit organization, City Fruit, to care for the fruit trees in Meridian Park’s orchard. 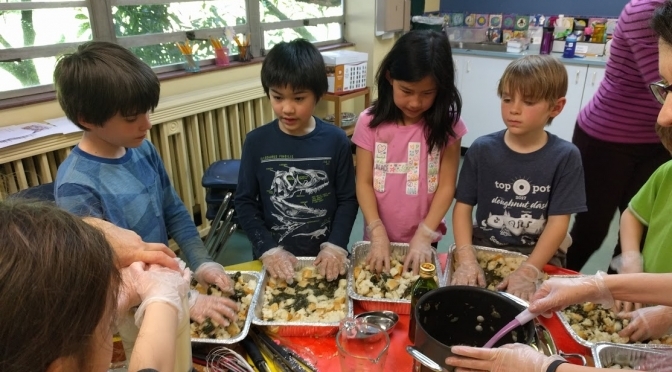 Second Graders partnered with Mary’s Place, and learned what they can do to raise awareness and support those who are homeless in Seattle. 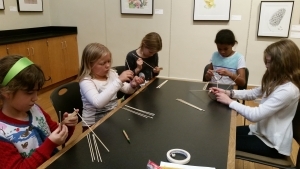 Second graders and their fifth grade buddies also continued their work with Washington Green Schools. 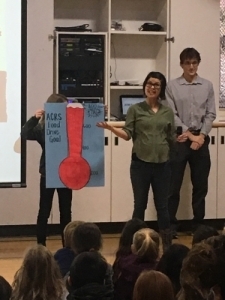 Third Graders coordinated and ran a school-wide community needs project with the Asian Counseling and Referral Service. ACRS is a local organization that promotes social justice and the well-being and empowerment of Asian Americans and Pacific Islanders and other underserved communities. 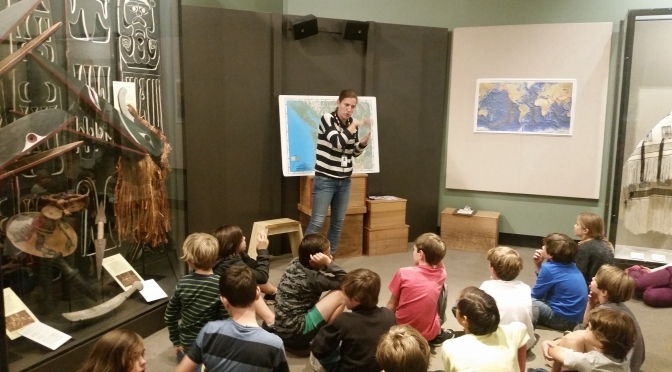 Fourth Graders raised salmon, and learned how environmental factors impact the salmon life cycle and population. 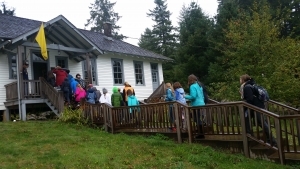 They released the salmon in Piper’s Creek, and supported habitat renewal with the Friends of Issaquah Salmon Hatchery. 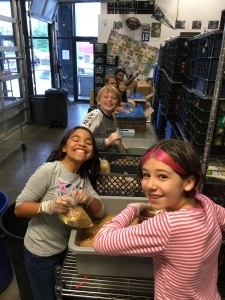 Fifth Graders completed a project with Washington Green Schools and their second grade buddies, and maintained a year-long partnership with FamilyWorks, volunteering at the local Wallingford food bank each month. 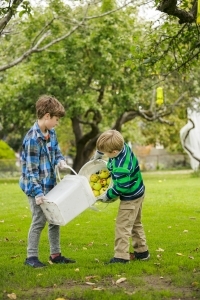 Service learning is a big project that we do here at Meridian, across all the grades. 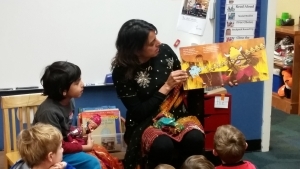 We learn about people, animals, and places in need and about causes, nonprofits and charities that support them. We learned that some nonprofits help people get the things they need to survive so they can have a better life, not just live from day to day. 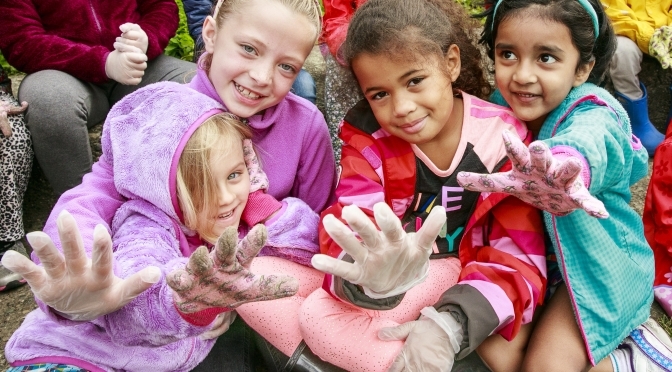 Service learning is important because we’re actually doing things, not just talking about it. This year in particular many of our projects tied into Global Studies, so it’s educational and helpful! We as a school like to give back. Our school motto is Meridian Cares–I care for myself, I care for others, I care for my place. Service learning does all three! It improves our place by keeping the environment clean and safe, it helps others when we volunteer with nonprofits that give people safe places to live and things that they need, and it helps ourselves because you feel good when you are learning what you can do to help. 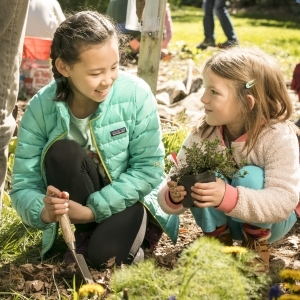 Service learning is great because you’re taking care of places and other people, which isn’t something that happens a lot, especially since we’re kids. We always talk about how where you live affects how you live, and it’s really easy to see that when we are doing service learning. We are looking forward to continuing it at Meridian, but also just in general in our lives. This type of learning helps us be prepared for the future, and not everybody gets those experiences so it’s important to learn how we can help so we can teach others later! Third graders study our local economy and neighborhood businesses. As they learn about the basics of economics, students do an in depth study of a local business in Wallingford. As a part of this study, students are required to interview business owners. They then become business owners for a day, managing a budget and creating goods to sell on Wallingford Day. The Meridian community is invited to “shop local” using “Wallingford Money”, a currency only spendable in third grade on Wallingford Day. In third grade we learn a lot about businesses and organizations in our community and the city of Seattle. 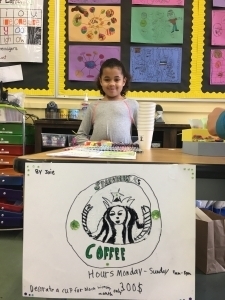 On Wallingford Day everyone in third grade recreates a mini version of the business that they studied and shares their projects with the whole school. Before we picked our business, we walked down 45th Street and saw and learned about all the different businesses. We took notes of the services or products that each business sells. On Wallingford Day, all of our visitors are given 40 Meridian dollars to spend, and we see who has made the most at the end of the day. Then we have to pay taxes! 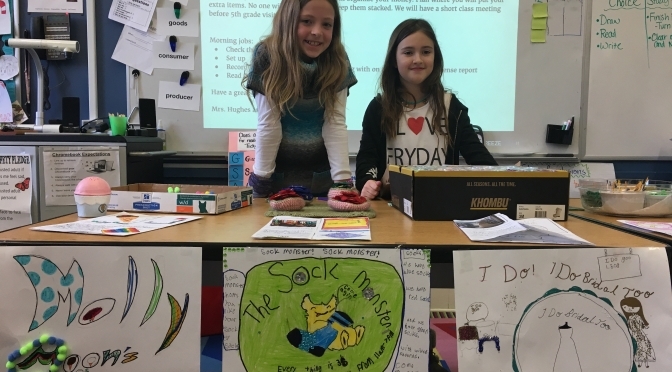 This project was important because It taught us about economics, and how to run a business. We were surprised by how much taxes people have to pay! We learned that it’s a lot of fun to be able to sell things, and it helped us understand what it might be like to have our own business, and it inspired some of us to hopefully run our own business one day. This month we also ran a food drive in third grade. We are studying Oceania, so we were trying to find a way to include service with our Global Studies unit. That’s when we decided to work with ACRS (Asian Counseling and Referral Service). ACRS runs lots of programs, and a food bank that collects special foods like tofu, rice, soy milk and noodles. These are some traditional foods from Asia and the Pacific Islands, and might make people feel at home. First we presented at Friday Morning Meeting to try to get our whole school excited about our food drive. Our goal was to collect 800 food items, but we only got to 790. We realized at the end that our goal should have been about the weight of the food and not the number of food items, because the actual amount of food we collected was way more than the items. Our goal was to feed lots of people, so large bags of rice were only one item, but enough to provide some food for an entire family. It helps looking at things with a different perspective! It felt great to help other people and know that all the items we donated were going to feed so many people. It was a lot of hard work and we were scared at the beginning that we wouldn’t succeed. We were surprised and happy that everyone was so eager to help. It was a really cool experience to see everyone our whole school want to get involved. We ha d so much fun at Community Service Day this year! Doing things to help isn’t always easy, but we had a lot of fun helping the community. 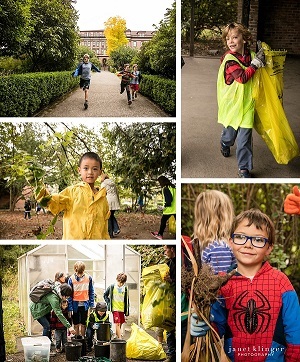 During the day we picked up trash with little grabbers. One of the groups went to the sidewalk, and the other group walked around the park picking up trash left by people. 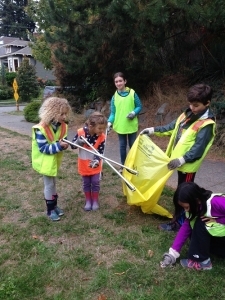 We learned that there is a lot of litter, especially in places we didn’t think there would be, around our neighborhood. There was a lot of trash on the ground, and there was even a soda can in the middle of the road! Community Service Day is important because it helps make the area cleaner, and makes the community safer for adults, kids and plants. It also makes the park and playground look good for everyone who visits. It was great to work with our 5th grade buddies! It made it easier to not have to hold the trash bag and use the grabbers to clean up the trash. They also helped because they were able to reach the trash better with their longer arms. It was fun to have new people to work with, and was also nice to have so many parents there helping us out and keeping us safe. We are very excited to be older buddies, and to spend Community Service Day with Kindergartners next year!